Geography is a study into how spaces are produced. In this seminal work ‘The Production of Space’ geographer/philosopher Henri Lefebvre describes the social production of space, referring to the intimate relationship between space and human activities. We create spaces which in turn create us. Mechanisms of power, economics, culture, history and science influence the type of spaces we create, what they look like and what takes place inside them. From the earliest to the most contemporary, maps have provided us with the means for depicting, understanding and exploring the world, but at the same time can only provide a reduced view of what a space is composed of. In other words, what do maps show and what do they not? Through a series of artist and theoretical lectures, screenings, onsite explorations and student-driven research, this workshop was intended to introduce participants to different cartographic and geographic strategies for describing, understanding and interpreting space. 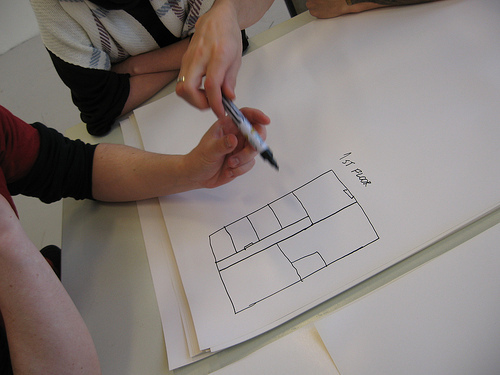 Participants produced a group work where a focused geographical reading of the cultural space of the Bergen National Academy of the Arts (KHIB) was be made. Through a series of mapping exercises, workshop participants attempted to define how the cultural space of the academy is produced, within the academy itself and its relation to broader critical issues pertaining to cultural / artistic practices and (administrative, economic, political, etc) systems. Information generated through online and onsite research was then brought together within individual proposals by each workshop participant. Comments closed — Trackback URI RSS 2.0 feed for these comments This entry (permalink) was posted on Thursday, November 19, 2009, at 7:09 am by admin. Filed in Teaching/Workshops.